Time to kick those New Year fitness resolutions into gear! Our goal is to be the most active, healthy community in Nova Scotia, and we need your help. Are you in? It’s time to sit less and move more! We all need activity in our lives. Being active daily will leave long-lasting, positive benefits to your physical, social and mental health. Looking to try something new? The Town of Amherst has many opportunities available including free recreational skating, free snowshoe equipment lending, an outdoor trail system, indoor walking track at the Amherst Stadium and a dog park for your four-legged friends. Programs available include Adult Learn to Skate, Adult Multisport, Pickleball, YMCA Full of Life Programming and an indoor walking club, all offered free of charge. For community listings and program details visit Amherst.ca. The fifth annual Amherst Winter Carnival runs from Feb. 12-18. In support of an active healthy Amherst, this week-long festival has more than 100 ways to celebrate heart, culture and play. Visit our recreation page on the Town of Amherst's website for a full calendar of events. Highlighted Winter Carnival events include the Town of Amherst Athletic Achievers Ceremony, Celebrate Vincent Art Exhibit, the Amherst Valentines Run, Wellness Expo, free swims, Outdoor Play Day, Chili Cook off, Alpine Curling, Maritime Story Telling Circle, Family Bowling, darts and Junior A hockey action. Are you looking for Valentine’s plans? Tickets are still available for ‘A Comedy Night featuring Dylan Mahaney. Doors open at 6 p.m., show starts at 7 p.m. Bring your sweetheart for an evening of laughs while enjoying a decadent dessert, tea or coffee. Tickets are $15 available at Bliss Café, Amherst Town Hall, Simply for Life and Eventbrite.com. There are some great workshops being offered by local partners during Winter Carnival. Sign up for a sketching/drawing class with artist Jan Boiduk. Send in your favorite photo to enter the Winter Photo Contest. Learn some social media marketing tips, tricks, and tweaks with ARC Social Media, or enjoy a Detox, Sleep Breath Workshop or Couples Massage with Stephanie Allen from Gateway Wellness & Leadership Development. Sign up for the Dream Pillow Workshop, Needle Felting Workshop or Hooking Owl with Logan Workshop. Learn some healthy tips at the Forget the Weight Feel Great Workshop at the Atlantic Superstore. Wear red for National Flag day. Skate under the stars with The Snore Shop on the outdoor skating surface. 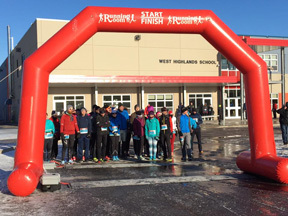 Registration is open for the Annual Amherst Valentine’s Run on Saturday, Feb. 16. Runners of all ages will participate this year in a 1k 3k, 5k, 10k or half-marathon route. New this year is the 1k, which is aimed at encouraging youth to put on their sneakers and venture out in the cold! On Feb. 16, head over to Dayle’s Grand Market. There things will heat up as local politician’s battle it out to claim the title of Chili Champion at the Chili Cook Off. Come listen to live music, shop local, visit the tables of local partners during the Wellness Expo, while taste testing different pots of chili. Cast your vote for your favorite! Will the reigning champ, Town Of Amherst Deputy Mayor Shelia Christie triumph once again? Taking place on the second floor of Dayle’s will be JC’s Tae Kwondo Board Breaking Demo. Outdoor Play Day will take place on Feb. 17 at Dickey Park! Enjoy some outdoor play, street hockey with the Ramblers, a Doggy Social, snowshoeing and sledding - weather permitting.